The Good War: Why We Couldn’t Win the War or the Peace in Afghanistan is aptly named and sure to find its lasting place as the first full narrative of the U.S.-led intervention from 2001 through 2014. The timeframe is something of a moving target, depending on where you begin and end, and the theme is richly explored. This review will refer to several other of the more revealing books that fall into what could now be properly labeled a genre of Afghan War literature. Jack Fairweather. The Good War: Why We Couldn’t Win the War or the Peace in Afghanistan. New York: Basic Books, 2014. ISBN: 978-0465044955 (hardcover, $29.99). Jack Fairweather’s effort to cover thirteen years of what he characterizes as misconceived warfare and nation-building fantasy is highly credible, certain to be mined extensively as future accounts turn narrative into history. An experienced journalist, Fairweather was a prize-winning field reporter for the Daily Telegraph and has authored A War of Choice: The British in Iraq 2003-9. Using Iraq in frequent cross-comparison, his method is straightforward: to report the story. He relies principally on interviews, including with every senior American and British commander and ambassador, as well as a large number of allied officials and Afghans, who cooperated with varying degrees of forthrightness. He is at his best recounting lesser-known back stories of well-reported events. For example, he tells how CIA Station Chief in Pakistan Robert Grenier’s initiative to open talks with the Taliban shortly after the campaign to overthrow it began might have held the key to ending the war in 2001, and what led Colonel Mick Nicholson to be one of the first Army officers to promote counterinsurgency (COIN). Such a sweeping account cannot be without gaps; the campaign in the South during the surge in 2009-2012, for example, seems a bit short-changed. But this is a critique, not a criticism. Afghanistan — at once the ultimate tribal nation on the periphery and for millennia the crossroads of competing empires — is an enormously complex place. It should be no surprise that intervening powers have found themselves serially flummoxed, or that those, like Fairweather, who attempt to write about it find themselves fathoming multiple and ultimately irreconcilable narratives of the truth. Cross: You may think you know what you’re dealing with, but believe me, you don’t. Cross: Why is that funny? Gittes: It’s what the district attorney used to tell me in Chinatown. Like that of Jake Gittes in Chinatown, Fairweather’s investigation in The Good War can be read as a cumulative stringing together of encounters in which few if any of the protagonists effectively know what they are dealing with, whether it involves understanding motivations or the dynamics of war in Afghanistan. Of many such episodes in The Good War, the ill-fated attempt by the U.S. military to control the remote Korengal Valley in North-Eastern Afghanistan emerges as a leitmotif for the entire war. As the setting for two book-film combinations, the Korengal has become a ground zero in popular culture that derives purifying heroism from military disasters. In the book War and the film Restrepo, an infantry platoon survives an ordeal in “the Valley of Death,” and in Lone Survivor, a special operations kill-capture mission gone wrong metamorphoses into a best-selling tale of Navy SEALs in action. Fairweather’s exercise in truth-telling about the Korengal Valley deals in the doubts and second guessing of commanders as what began as manhunting for Al Qaeda terrorists became an interdiction operation against Taliban insurgents, then turned to hearts-and-minds Counterinsurgency (COIN), but instead devolved into an enervating nightmare of attacks and casualties that lasted from 2006 until troops were withdrawn in 2010. Fairweather notes in passing that B Company, 1st Battalion, 32nd Infantry Regiment “set up a base in an abandoned sawmill on a mountain slope” (223), a scene also caught in a dramatic shot of soldiers leaping into combat across a pile of lumber in Restrepo. This apparently unremarkable detail hid a key to the antagonism that made the Pashai tribesmen who call the valley home impervious to the most well-meaning blandishments and largesse from the American soldiers who remained clueless in Korengal. Resentment of the infidels who had invaded their mountain fastness was legitimate reason enough for these conservative Muslims from a warrior culture to wage jihad and align, if only tacitly, with the enemy Taliban. Beyond this, the Pashai’s hostility extended to their Afghan Pashtun cousins who controlled the district headquarters and derided them as backwards hill people. But (as a few Americans did come to understand) the U.S. troops who sat astride their sawmill and surveilled their valley had also inadvertently put a stop to their livelihood — timber smuggling to Pakistan. This ultimate insult rendered pacification of the Korengal a mission in futility. Wars generate literature, enormous volumes of it. Since Afghanistan has been in conflict of one form or another almost continuously for thirty-five years, the library seems already beyond cataloging even as it continues to grow. Where does The Good War fit? The genre could be called the second version of history, the one written by diplomats, soldiers, scholars, and journalists beyond the realm of news but before the fighting has ended and the consequences have unfolded with the passage of time. From the Afghan perspective of action and inaction by the Great Powers, Fairweather’s narrative begins at a mid-point between the Soviet invasion in 1979 and intervention by the United States and its coalition partners in 2001 in the aftermath of 9/11. His blow-by-blow account of the conduct of the war develops from the conflation of counterterrorism into a fight against tribal Islam in late-2001, through the surge that began in 2009, to the full-blown international drawn down in 2014. The central question that The Good War contributes to answering is, why did more than a decade of enormous effort and cost in Afghanistan lead to such inconclusive results? In interpreting events and recording the views of dozens of people who were involved in them, Fairweather does not sympathize with the common apologies: Afghanistan is the graveyard of empires; those contentious and corrupt Afghans are to blame; the U.S. should have pulled out after overthrowing the Taliban and left the job to drones and covert action instead of combat troops. What The Good War does with these multiple layers of narrative is build a compelling mosaic of the ‘know-yourself’ side of the strategic equation. Although, as the detailed chronology unfolds, the larger picture often remains elusive. Back to the Chinatown syndrome. The Good War begins in 2014 with Afghan President Hamid Karzai pacing his Kabul palace garden, troubled because “it was he who had brought the Americans to the country,” and they had failed in their promise to end the war and develop the nation (xv). But was it Karzai who brought the Americans into Afghanistan, or was it the other way around? One first accounts, the well-titled Punishment of Virtue by Sarah Chayes, reveals a more intertwined, less straightforward relationship. As a guest and confidant of the Karzai clan following the overthrow of the Taliban until her own fraught falling out with them in 2005, she witnessed the CIA and Special Forces override Karzai’s authority and betray his trust almost from the start, while Karzai learned to use the hyper-centralized power he received when he became President to enmesh the U.S. Government in a very expensive commitment trap. As a British journalist, it is only natural that Fairweather closely follows the distressed British experience in Afghanistan. To complement his interviews with commanders in headquarters and the field, it is well worth mentioning that two of the best memoirs to come out of Afghanistan are by British soldiers. In the Desert of Death, Major Leo Docherty deployed in 2006, when the controversial British commitment to ‘take charge’ of Helmand Province began, only to realize that the promise to follow combat operations with serious development aid was largely a façade. And War from the Ground Up, by young Army Captain Emile Simpson, who read History at Oxford, is becoming recognized as a unique and deeply insightful account of warfare in the modern age. The political centers of gravity in The Good War naturally shift between Kabul and Washington, DC, as multiple layers of doubts, tensions, and conflicts play out among Afghans and Americans, coalition partners, and successive commanders and ambassadors. In the manner of the journalist Bob Woodward’s Obama’s Wars, President Obama’s own team of rivals emerges as an institutionalized variant of Afghan tribal factionalism and personal rivalries. The efforts of the White House to centralize and micromanage Afghanistan, the friction between dominant military commanders and U.S. ambassadors, and the feckless manner in which policy and strategy are made reflect national security agencies and civil-military relations badly in need of reform. The Good War adds to the emerging judgment that, rather than innovative brilliance, the troop surge announced in 2009 and the adoption of COIN amounted to a belated and fatally time-bound attempt to compensate for prior errors. Fairweather relentlessly narrates the deployment of tens of thousands of U.S. Marines to Helmand province, where they spread across ‘strategic’ desert villages in the back and the hard- fought but hardly decisive 2010 ‘Battle of Marja’ into a public spectacle. What it all added up to is best answered in Little America, Rajiv Chandrasekaran’s book about the war in Southern Afghanistan: the Marines, operating in effect beyond ISAF headquarters and the commander-in-chief, spent their effort in a province, that while a significant Taliban area, contained less than three percent of the Afghan population and was of less strategic importance than Kandahar next door, thereby squandering a significant percentage of combat power dedicated to the surge. Fairweather’s guiding thesis is that the good war in Afghanistan became a war badly run because of misconception, profligacy, and missed opportunities. To illustrate what getting Afghanistan right might have looked like, as others have done, he singles out Carter Malkasian, of the few Americans whose knowledge of Pashtu and dedication to his role as a Political Officer won him the effective trust of the local people and the honorific ‘Sahib.’ Malkasian recounts his own experience in the excellent War Comes to Garmser, which echoes in both title and lessons War Comes to Long An, Jeffery Race’s telling account of insurgency and counterinsurgency in a Vietnamese province. The press bestowed another honorific on Malkasian — ‘Carter of Garmser.’ The evocation of T.E. Lawrence brings to mind his famous Twenty-seven Articles, the principles he followed in leading the Arab Revolt that helped defeat the Ottoman Turks in World War I. Perhaps the most important of them was: “It is their war, and you are to help them, not win it for them.”  There is a compelling argument to be made that violation of this dictum stands out as the signal error of the United States in Afghanistan. The proposition of a better alternative runs through The Good War, but unfortunately it is dubious. Fairweather is a fan of ‘small is beautiful’ nation-building and the ‘one valley at a time’ hypothesis of counterinsurgency. Such soft-power, people-to-people approaches are consistent with modern norms and certainly promise partial solutions. But take a look at a map of Afghanistan and do the math. It is a good thing that some civilian officers are willing to go to war and that the Special Forces have learned to balance hunting terrorists by reverting to their core mission of helping others fight their wars. But COIN is a method, not to be confused with a strategy. Feuds localized in Afghanistan’s hundreds of valleys are embedded in a national and ideological struggle for power, and it is at that level where political and military success must reside. The most important thing about a war is how it ends. 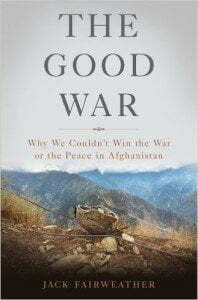 But the end of the war in Afghanistan does not come with the final chapter of The Good War. Instead, the President’s declaration that “the tide of war is receding” marked a unilateral waning of investment, not announcement of a coming peace. Todd Greentree is a Research Associate in the Oxford Changing Character of War Programme. A former U.S. Foreign Service Officer with service in five wars, he was political military advisor to Task Force Warrior in Eastern Afghanistan and 5/2 Stryker Brigade Combat Team in Southern Afghanistan, and headed the Regional Command – South Initiatives Group in Kandahar at the height of the surge in 2010-11. His recent publications include “A War Examined: Strategic Errors in Afghanistan,” Parameters, 43:3, Autumn 2013; “Bureaucracy Does Its Thing: U.S. Performance and the Institutional Dimension of Strategy in Afghanistan,” Journal of Strategic Studies, 36:3, June 2013; and “Triple Feature: Hollywood Classics Illuminate the Complexities of Afghanistan,” The American Interest, VI: 5, May/June 2011. Currently, he is writing about the Reagan Doctrine Wars in Angola, Central America, and Afghanistan. Sebastian Junger, War (New York: Twelve, 2010); Restrepo, directed by Sebastian Junger and Tim Hetherington (New York: Virgil Films and Entertainment, 2010); Marcus Luttrell, Lone Survivor: The Eyewitness Account of Operation Redwing and the Lost Heroes of SEAL Team 10 (New York: Little, Brown and Company, 2007); and Lone Survivor, directed by Peter Berg (Hollywood, CA: Emmett/Furla Films, 2013). Daniel P. Bolger, Why We Lost: A General’s Inside Account of the Iraq and Afghanistan Wars (Boston, MA: Houghton Mifflin Harcourt, 2014); Jack Devine, “The CIA Solution for Afghanistan,” The Wall Street Journal, July 29, 2010; Seth G. Jones, In the Graveyard of Empires: America’s War in Afghanistan (New York: W. W. Norton & Company, 2009). Sarah Chayes, The Punishment of Virtue: Inside Afghanistan after the Taliban (New York: Penguin Press, 2006). Leo Docherty, Desert of Death: A Soldier’s Journey from Iraq to Afghanistan (London: Faber & Faber, 2007). Emile Simpson, War from the Ground Up: 21st Century Combat as Politics (London: C. Hurst & Co., 2012). Bob Woodward, Obama’s Wars (New York: Simon & Schuster, 2010). Rajiv Chandrasekaran, Little America: The War within the War for Afghanistan (New York: Alfred A. Knopf, 2012). Carter Malkasian, War Comes to Garmser: Thirty Years of Conflict on the Afghan Frontier (London: Hurst & Co. 2013); Jeffery Race, War Comes to Long An: Revolutionary Conflict in a Vietnamese Province (Berkeley, CA: University of California Press, 1972). T.E. Lawrence, “Twenty-seven Articles,” Arab Bulletin, 20 August 1917. Adrian Bogart, One Valley at a Time, JSOU Report 06-6 (Hurlbert Field, FL: Joint Special Operations University Press, 2006); and Hy Rothstein, Afghanistan and the Troubled Future of Unconventional Warfare (Annapolis, MD: Naval Institute Press, 2006). Thomas Barfield, Afghanistan: A Cultural and Political History (Princeton, NJ: Princeton University Press, 2010).